Heading east on I-70 from St. Louis-Lambert Field it was a five-minute drive to my exit. As I approached the ramp there was a sign that read “Historic Ferguson, 1 Mile.” The arrow pointed north. My destination, the University of Missouri-St. Louis, was south. We took note of it and continued to the university where we were speaking the next day. The three of us went about our business preparing for our presentation then lapsed into a short conversation about whether to take the short detour to Ferguson. Afterall, two of us were former broadcast journalists and the lure of a location so much in the news has a strong pull. We allowed our curiosity to simmer for the evening but the thought of seeing the city firsthand gnawed at us, but still, not enough to add a quick visit to our already packed itinerary. The plan was to give the presentation, spend a little time with the students afterwards then run to the airport for the return to Detroit. Sightseeing wasn’t part of the plan. But then things changed. Events at the conference moved along quickly and we found ourselves with some extra time. An earlier flight back to Detroit was full so all we had was time. There were two ways to get to the airport from the school. Retrace our route which took us to that sign pointing to Ferguson, or around the southern perimeter of the college, circumventing the route to the infamous town. The conversation was short. The decision, easy. 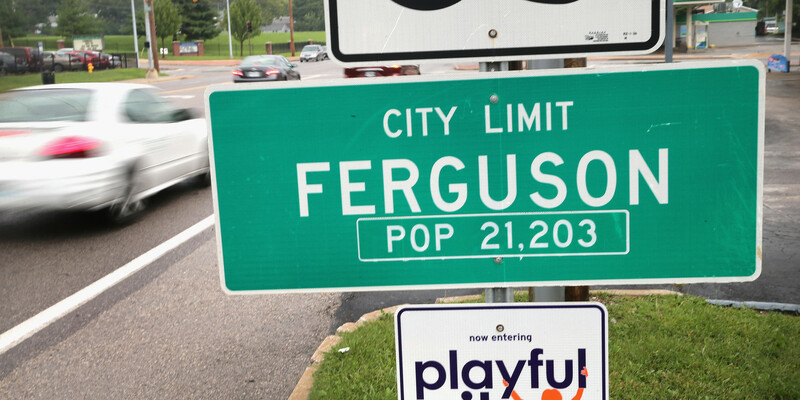 Ferguson is not a tourist attraction. We would not be out-of-town voyeurs doing a drive-by assessment of a town with complicated issues. What would we learn by buzzing past locations seen so many times on the news, but not getting out and spending time speaking with people. Would they even want to speak with us–some PR people from a big corporation who once made our living asking such questions and writing the stories and simply wanted to be close to the big story once again? In the name of dark, cynical newsroom humor, we used to crack, “yeah, we steal their image and take them out of context.” Still the idealistic Baby Boomer, my instincts told me to just leave it alone. Don’t be “that guy” treating a troubled burg as a place to kill time and an excuse to tell others, “I was there, ” in this era of “checking in” every place we check out. Driving through on a 5 minute detour to the airport isn’t “being there,” None of us have “been there.” Only those who live there can say that. Indeed, understanding the complicated issues surrounding Ferguson, requires reflections, extensive reading, research. Going the extra mile, doesn’t not necessarily mean simply driving it.